Forming the anterior wall of the vertebral canal, this strong ligament spans from the body of the Axis (C2) to the posterior surface of the sacrum. Like its anterior counterpart, the Anterior longitudinal ligament, its deep fibres are intersegmental while the more superficial fibres can span up to four vertebral levels. In the cervical and thoracic regions it has a uniform width over the bodies and discs, but in the lumbar region the ligament is widest at the levels of the intervertebral discs where it is firmly anchored to the Annulus fibrosus, cartilage of the Vertebral end plates, and the margins of the vertebrae. Its cranial counterpart is the tectorial membrane. This ligament is composed of smooth, shining, longitudinal fibers, denser and more compact than those of the anterior ligament, and consists of superficial layers occupying the interval between three or four vertebrae, and deeper layers which extend between adjacent vertebrae. The superficial layer is a continuation of the Tectorial membrane at the body of axis while the deep layer is a continuation of the cruciform ligament of the atlas. The posterior longitudinal ligament runs in the spinal canal attaching to the vertebral bodies and vertebral discs and tightens with cervical flexion. 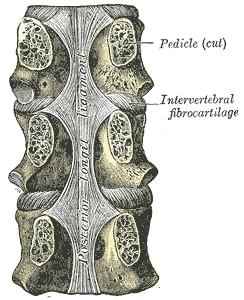 Arising at the superior margin of one vertebra they span to the inferior margin of the vertebra that they attach to.Forming the anterior wall of the vertebral canal, this strong ligament arises from the body of the axis (C2) body and travels downward and posterior to the vertebral bodies (attached loosely) and intervertebral discs (firmly attaching to the posterior annulus), attaching to the back of the sacrum. It narrows as it travels downward and also has a serrated edge. It is broader above than below, and thicker in the thoracic than in the cervical and lumbar regions. The ligament is more narrow at the vertebral bodies and wider at the intervertebral disc space which is more pronounced than the anterior longitudinal ligament. This is significant in understanding certain pathological conditions of the spine such as the typical location for a spinal disc herniation. 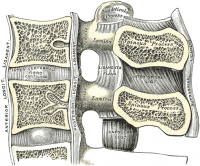 Limits flexion of the vertebral column and reinforces the intervertebral disc. OPLL is a condition in which the flexible structure of the posterior longitudinal ligament becomes thicker and less flexible. It most commonly occurs in the cervical spine. OPLL typically presents with none or mild symptoms at the beginig. Mild symptoms may include; mild pain, tingling, and/or numbness in the hands. OPLL can also cause dysesthesia, an unpleasant sensation that accompanies touch. Sometimes an unpleasant sensation may be present without any touch. As OPLL progresses, symptoms typically become more severe. If the ligament takes up valuable space within the spinal canal as it thickens, it may compress the spinal cord, producing myelopathy, with symptoms that include difficulty walking and difficulty with bowel and bladder control. OPLL may also cause radiculopathy. Symptoms of cervical radiculopathy include pain, tingling, or numbness in the neck, shoulder, arm, or hand. Diagnosis is often made by findings on X-ray, CT and MRI imagining. Conservative treatment methods include pain medications, anti-inflammatory medications, anticonvulsants, non-steroidal anti-inflammatory drugs (NSAIDs) and topical opioids. Surgery may be indicated if a patient presents with signs of myelopathy. ↑ Nigel Palastanga; Roger W. Soames (2012). Churchill Livingstone, ed. Anatomy and Human Movement: Structure and Function. ↑ Ehara S, Shimamura T, Nakamura R, Yamazaki K. Paravertebral ligamentous ossification: DISH, OPLL and OLF. European journal of radiology. 1998 Jul 31;27(3):196-205. ↑ Finnerup NB, Johannesen IL, Sindrup SH, Bach FW, Jensen TS. Pain and dysesthesia in patients with spinal cord injury: a postal survey. Spinal cord. 2001 May 1;39(5):256. ↑ Yonenobu K, Hosono N, Iwasaki M, Asano M, Ono K. Neurologic complications of surgery for cervical compression myelopathy. Spine. 1991 Nov 1;16(11):1277-82. ↑ Eubanks JD. Cervical radiculopathy: nonoperative management of neck pain and radicular symptoms. Am Fam Physician. 2010 Jan 1;81(1):33-40. ↑ Matsuyama Y, Yoshihara H, Tsuji T, Sakai Y, Yukawa Y, Nakamura H, Ito K, Ishiguro N. Surgical outcome of ossification of the posterior longitudinal ligament (OPLL) of the thoracic spine: implication of the type of ossification and surgical options. Clinical Spine Surgery. 2005 Dec 1;18(6):492-7.